The Children's Ministry at Oak Grove seeks to create an atmosphere for all children and their families that welcomes, invites, and serves. 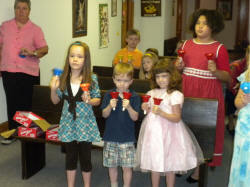 We strive to teach our children about the love of God as seen in the person and life of Jesus Christ. We hope our children learn that they are an important part of sharing the Word of God and the love of Jesus Christ with all people. If you need to know more or would like to lean how you and your family can get involved, please contact Joyce McClamrock, Director of Children, and Family ministries at (336) 998-0796.